Google Adsense Alternatives is one of the big contribution to my Blogging career, but it is really difficult to choose adsense alternatives, that only because of number of bogus advertisement networks out there and people are writing about them without trying them on their blog. So, here is the story about me, I have earn more than $932 from Advertisement networks other than Google Adsense, I have tried many advertisement networks but I like only two because those networks really take care for their publishers as well as advertisers. Update 2018 September: As today I have earned over $5000 from ad networks, but I earned much more from affiliate marketing, read recent article related to affiliate marketing tips for beginners. See, till now I have helped more than 1000 bloggers to let make money online from their blog, hopefully they are blogging now, because I don't have that much time to check one by one. Because, I am blogging, see as a blogger from India, I always wanted to earn some pocket money from blogging, but when I have earn $145.85 and got check from them at my village, then I change my thinking about part time income, later I have been increasing my earning every month. And I am really happy with it, it was the time when I have started blogging in that time, I always look at other blogs and waiting for traffic to my blog, but I never got traffic, because I was doing mistakes in blogging and I hope, I am doing some mistakes now a days even, but I don't know about them. Because, I have learned lot of things from those mistakes, I think mistakes really good at earlier because you are not going to repeat those mistakes later. Most of the bloggers said that Bidvertiser CTR (Click Through Rate) is not good but I think its not Bidvertiser fault its a fault of bloggers, because they just don't put advertisement networks on the right place. See, if you want to get more clicks (That means more revenue) then you need to put ads below each title of your blog posts, you need to get more visitors too, if you are not able to put Bidvertiser ads below each post, I mean you may face error, difficulties etc then don't forget to contact me. Because, the experiment I did in 2012, when I was upset with Click through rate of my blog ads and you know if less clicks is there that means less income, so for increasing my blog income I have started experimenting and I found it. 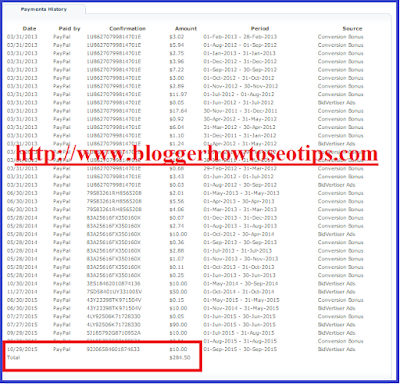 In actual, till date I have earn more than $390 from Bidvertiser, here is the screen shot for proof. 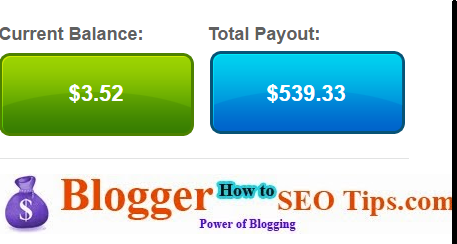 My first earning was $10 in blogging, I have earn from Popads.net, that's why I like about this ads network, if you have traffic from English speaking countries then you will see in your earning will increase by 200 to 500%, see if you are getting traffic then you will make money, does not matter from where your blog getting traffic. Frankly, I tell you, there is only one way to earn more money from blog that is driving more traffic to your blog, but yes other than this you can monetize your blog much better way like ads network, affiliate marketing, your's own product and it could be anything you can do to earn money from your blog traffic. Ads Networks for Blogs- Ads networks for blogs are many I have used many of them and I have upload payment proof also on this blog. Affiliate Marketing- This is one of the great way to earn money online and I mean there is more profit, you can maintain this for long time profit if you will promote right product on your blog. Own Products- Great way to earn more and satisfy your blog readers, you can do it for long time but you have to work hard, yes real hard work, you need to write your blog post each article like the best, yes, the best. Actually, one of my blog readers as well as my internet dude, he is really good in writing and SEO, he asked me this question and my answer was the same. He is earning very good money these days. So, I will tell you to implement all these things on your blog for getting result more important you can come to know few more things this will lead you to know the better way to earn more money from your blog. See, there are many networks those tells that they are really best, but real cine come to know when you have used them and it worked. I have used these networks on my blog and earned, so my recommendation to you is start using these ads networks and find out the best one and at the same time start learning affiliate marketing. Is there any other networks which really take care about Publishers? Hi Ujjwal,I have become too interested in affiliate marketing because of you.I inspire when I read your blogging journey and in this post I really like your approach towards blogging. Thanks Ujjwal, I was only depended on google Adsense. You have shown me the other ways from which i can monetize my website. You are right there are other ways too, but you need to find the one to make you more money online. If you need any help regarding blogging then let me know? Nice post and great earnings. But what is the niche you used ?